abjad is just the first four numbers (1 = a, 2 = b, j = 3, d = 4). 100, 200, 300, ... , 900 by the next letters (100 = q, 200 = r, 300 = sh, 400 = ta, ...). There were 28 Arabic letters and so one was left over which was used to represent 1000. The numbers changed their form somewhat 100 years later when this copy of one of al-Biruni's astronomical texts was made. Below are the questions from the booklet and answers. What are the 3 main points or more that I have learnt from all the activites? How can these pointers be of help to you? If you were to have another chance to try out all the activites, which one will you choose? Why? -I would try out the flying fox. Though the journey up seemed scary, coming down was kind of like the best part. It reminds me of when the going gets tough, but when you have finished you feel so elated. If there is one thing that you can change about yourself, what would that be? -It would be my fear of heights. Thats all for now, I have to rush off to attend something, Bye! 1) I understand that not only we can use our Macbooks to find and learn information, we can also learn by looking at books, ask from people and so on. 2) It is important as we need to be widen our horizon for information. To widen our horizon for information, we need to make more new friends, connect with the community and eventually, help us with our schoolwork and projects. What are the strengths that you think you possessed which can help you to achieve excellence? I think that my confidence can help me achieve excellence. What other attributes and attitudes do you think you should cultivate to excel in the things you do? Having a lot of confidence, not giving up halfway, focusing on the project and not doing something else, and not being indecisive. I can help by participating in all the activities and make all of the classmates co-operate. Do note that the questions I'm answering is from the whiteboard. It differs from the questions in the post. And I've kind of re-phrased the questions I typed. Is it difficult to work with new people? -No it isn't. Its just that you need to break your personal boudaries and really, get to know some people in my class. How did I overcome my worry? My "shyness"? How did I contribute to the project? -I helped them to stick things together, cut items that need to be cut, and gave a few ideas to help with the constrution. -So that you can experience how to create this, learn teamwork, communication skills that may help us in the future when we need to do a project/assignment in a team/pairs. What is the one important skill I learnt and how can I apply it in class? -The skill is communication. I can apply it when we do projects/assignment or anything that requires teamwork, its important so as to reduce conflicts and improve teamwork and hand in the finished product on time. The last one is History Channel Video Digest, which I can't find the website but its on Facebook. I was unable to view it because my flash player is out-dated, it has videos about History in it, and it may be useful in learning History. 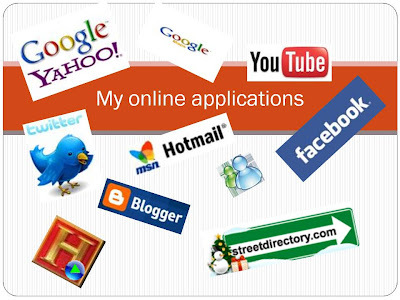 Out of all the applications mentioned, my favourite is facebook. Why? Because, we can get to get to know know other people from around the world, play online games with friends (not to mention compete with them), keep in touch even if you are sick, and maybe get to kinow what they are doing from their status updates.